Lost him at the canadian river atv park. 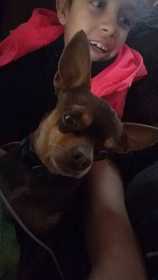 Hes a brown Chihuahua that has tan eyebrows along with his stomach being tan. Hes wearing a blue collar that has faded paw prints on it.